Meredith Danluck is best known for her work directing documentaries but for her feature film debut, the thriller State Like Sleep, she's coming out swinging. A year after her husband's suicide, Katherine (Katherine Waterston) is plagued by the unanswered questions surrounding his death. She can't recall what happened on the night of his death and when she begins to dig, it quickly becomes apparent that he was leading a double life and she seems to have wiped much of that from her memory. In addition to Waterston, the movie also stars Michiel Huisman, Rachel Wilson, Luke Evans and Michael Shannon. I love a good thriller and the combination of cast and this trailer certainly has piqued my interest. It'll also be interesting to see how Danluck's experience as a documentary filmmaker shapes her first feature film. 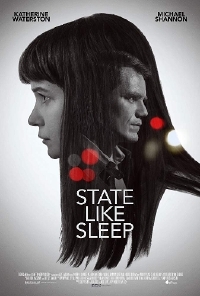 State Like Sleep will be available on digital and VOD January 1 with a theatrical release to follow on January 4.